Victor Chandler is the latest online bookie to launch a virtual horse racing product. Virtual Horse Racing has become a popular feature on most Bookmakers sites. Whilst it is a far cry from the real thing, Virtual racing is exactly what it says 'Virtual', an animatied simulation of a real life horse race that customers can bet on. Play for real at Victor Chandler! Virtual Horses is a fixed-odds game based on horse racing. 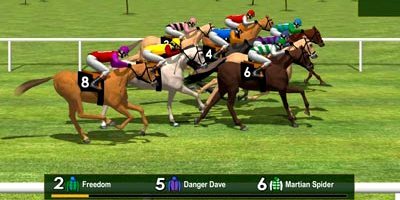 The game allows you to bet on an eight-horse race and then watch the race with high quality animations and commentary. There are 72 different bets available for each race. So why leave home? Virtual racing is popular amongst certain punters who like to bet when there is no live racing action, usuallly in the mornings and evenings. The Virtual racing at VCbet is called Chandler Park and claims to 'provides all the thrill and fun of the racetrack right to your home PC' and runs 24 hours per day. One of the better features of Chandler Park is that the number of horses in each race is limited to six. Each horse has its own owner and trainer, with different jockeys riding the horses from race to race. Game Rules Choose your stake from the selection of chips at the bottom left of the screen. To place a bet, click on the horse name, the odds or the forecast bet option of your choice. To make a bet on a horse to be placed, be sure to position your chip(s) in the box to the right of the horse's name, beneath the heading 'Place'. A chip will be displayed next to the bet option you selected. You may place as many bets as you like on each race, provided that your potential winnings do not exceed the maximum payout for a single game. You may choose different stakes for each of your bets - just select a new chip value or place multiple chips on each bet option. The total amount you have staked will be shown in the TOTAL STAKE box at the top of the screen. For each bet option the odds are displayed. Note that for place bets, the odds are one-fifth of the win odds. The odds for all place bets are displayed when you roll your mouse over the box to the right of any horse's name, beneath the heading 'Place'. To bet on a single race, press 'Bet Now'. The Race Once you press 'Bet Now', you will be taken to the race viewer screen, and an animation of the race will be played. Throughout the race, the three leading horses are displayed at the bottom of the screen, and a commentary keeps you updated on the action too. At any point during the race, you can press 'Skip' to skip to the end of the race and see the photo finish with the results. Turbo BetIf you do not want to watch the race at all, switch on 'Turbo Bet' before you press 'Bet Now' on the betting screen. Then when you place 'Bet Now', the photo finish and the results will be displayed immediately. By selecting 'Auto Bet' you can choose to place the same bets on up to 10 races automatically, one after the other. Make your bet selections as normal then press the 'Auto Bet' button to select the number of 'Auto Bets' you want before clicking the 'Bet Now' button. In 'Auto Bet' mode, your repeat bets are placed on the saddle cloth number rather than the horse name, since the names change for each race. You can stop 'Auto Bet' from continuing on to the next bet by pressing 'Stop Auto Bet' whenever it appears briefly on screen between races as shown here. While in 'Auto Bet' mode, depending on whether or not you want to watch the races, remember to switch 'Turbo Mode' on/off before you press 'Bet Now'. Within the game you can either have fractional (2/1) or decimal (2.00) odds. Other FeaturesBetting History: Select this from the Help/Options menu to display a log of the previous games in the current session, showing your bets placed and the outcomes. Animation off: Select this from the Help/Options menu - this is the same as switching on 'Turbo Mode'. Sound off: Select this from the Help/Options menu to switch off all audio within the game. Decimal Odds / Fractional Odds: Select this from the Help/Options menu to switch between decimal odds and fractions. Virtual Horses GlossarySaddle cloth number: The number the horse wears on its saddle cloth. The same odds are offered for each race, meaning Horse No.1 will always be the favourite, and so it is more likely to win and therefore has the shortest odds. The higher the saddle cloth number the less likely the horse is to win, and the longer the odds. To Win: A Win bet is simply predicting which horse will pass the finishing line first. Place: A Place bet is available to the right of the Win bet column, the odds are displayed when you place your cursor over the box. Place bets are paid out on three places, so if the horse you choose comes first, second or third, your bet wins. Forecast: A Forecast bet is where you predict first and second placed horses in the correct order. Forecast bets are displayed in the bottom half of the screen and are shown in the following format: 3X2 17/1 etc... where 3X2 indicates that you predict Horse No.3 will come first and Horse No.2 will come second and the odds are 17/1.